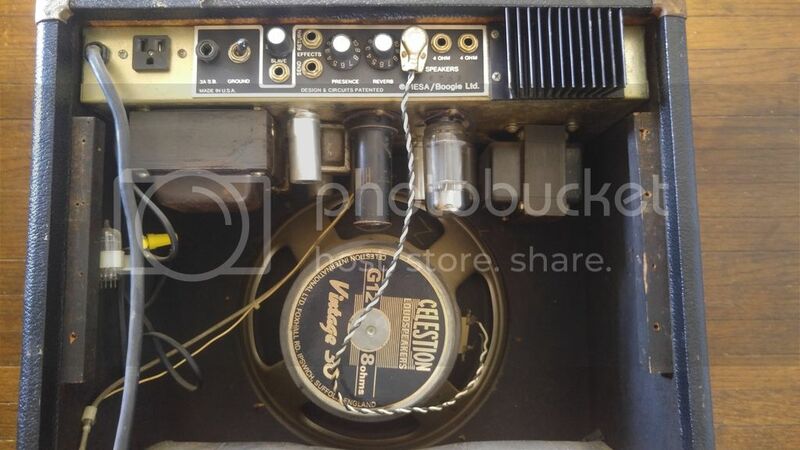 First things first, get that stupid metal can DEATH TRAP RCA 6L6 out of that amp and throw it in the trash. Never ever run metal can tubes in a guitar amp. No, you just don't do that. There's a reason for it that I'll get to shortly. 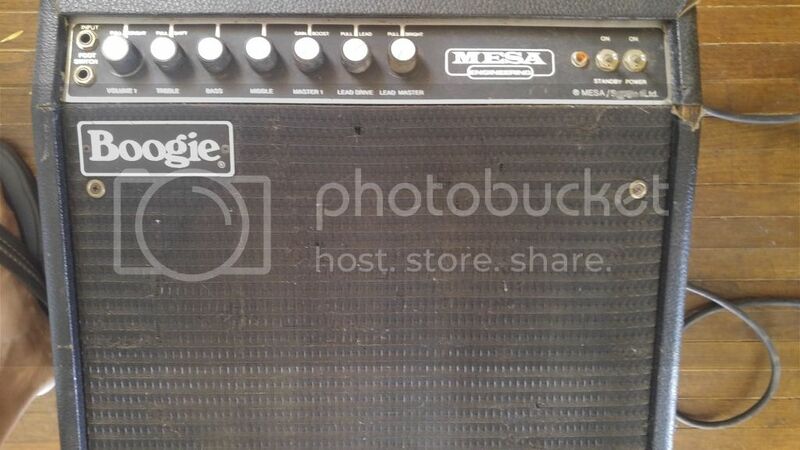 I've never personally seen an amp with those knobs on it before. Not even very early Mark 1s had anything like that. I think someone stuck those on it just to be different. I recommend getting correct knobs for it from Mesa. They do have them in stock. Your serial number marks this as a Mark IIB, to be certain of it. That black can 6L6 COULD be why the amp isn't working. The metal can is likely to be shorting a tube pin to ground that is not used on regular glass 6L6 tubes and is used as a tie point. So the tube's can is shorting the circuit to ground. By now if your amp has never had its capacitors replaced, it's in desperate need of having that done. If the caps completely fail, they can kill the power transformer and that's EXPENSIVE. It needs recapping and fresh glass. Find a qualified amp tech near you and have it done. Yeah, there are other tube sources but I trust Mesa tubes, end of story. I've had less luck with other brands. Put new knobs on it and if I were you I'd recover it, give it a cosmetic restoration. Thanks woodbutcher65, I'll order the knobs. Not sure which ones they are yet but assuming they're the same as the rear knobs. I'll have to find a tech to replace the caps. I've done that kind of thing before but would rather have a pro do it. I've ordered the tubes as well. I'll have to look into the recover but I know it would look a lot nicer. If you're inclined to do covering work, you could refurbish the amp to make it look very good, almost minty, for about 20 dollars worth of tolex, 10 for grill cloth, 10 for a handle, six new corners for a buck each, four new feet for 2 bucks each, and knobs for $4.20 each from Mesa, part number 409124. Call it a hundred bucks in parts. But some aren't available from Mesa. For the corners, get them from speakerbuildersupply.com which is where I'd also get the tolex and grill cloth. For the amp handle, get a Fender handle, the Pure Vintage style which is correct and shiny, not matte finished. So add that up and you'll see that you could rejuvenate that amp for not a lot of money. It's something of a classic and I'd do it in a heartbeat if it were mine. Replacing the caps is no big deal. I don't see any reason to pay an amp tech a hundred bucks in labor costs just to run a soldering iron for a few minutes. And I AM an amp tech! That's great info! How many caps are there? I haven't pulled it apart yet but it's probably pretty obvious. The knobs on the back have the silver center but the knobs you're referring to are all black. Should they all have the silver center? Like the Mark I 408109? These say they are the large shaft. When I look up images of the Mark IIB online they all have the silver centers. The transition to all black knobs took place toward the end of IIB production. I've seen IIBs with the later all black knobs on them, allegedly from the factory. Mesa stocks both those and the silver capped ones so you can have your pick, stick with the original style or update if you want. As for the filter caps, it should require two 220 uF caps (300 volt rating) and three 30 uF caps with a voltage rating of 450 or 500 volts. There's also a bias cap on the power supply that should be changed as well. You don't want that one to fail! To verify the values in your amp, take it out of the shell and take a look.